Jr. NBA / Jr. WNBA Basketball School Clinic On Sunday March 9 in Muntinlupa (Last In Manila): Let's Go! This is a good news for the kids who want to learn formal basketball as the Jr. NBA/Jr. WNBA Philippines 2014 presented by Alaska holds its last school clinic of the 2014 season on Sunday, March 9, 2014 at the Muntinlupa Sports Complex at Tunasan Baywalk St. in Muntinlupa City. Boys and girls ages 6 and up are welcome to attend. The Jr. NBA/Jr. WNBA program is free for participants across all stages. 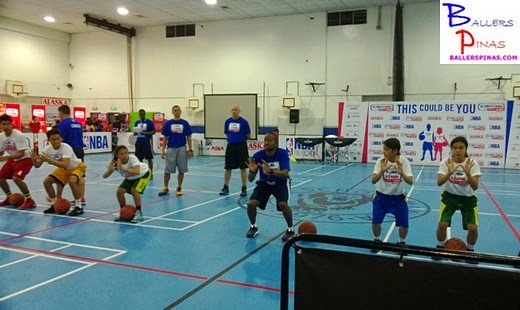 The school clinics are the first phase of the Jr. NBA/Jr. WNBA program and are designed to familiarize participants with NBA drills, conditioning exercises, skills stations and the all-important Jr. NBA core values of Sportsmanship, Teamwork, a positive Attitude and Respect (S.T.A.R.) that will prepare them for the remainder of the program. Phase two—the Regional Selection Camps, which begin Saturday, March 8 at St. Paul Gym in Surigao del Sur— will select standout young players in various regions that will be sent to the National Training Camp, the high point of the Jr. NBA/Jr. WNBA program where ten Jr. NBA and four Jr. WNBA All Stars will be chosen. Only boys and girls aged 10 to 14 can join the Regional Selection camps. The school clinics, however, are open to participants younger than 10 and older than 14 years old. After the Surigao Regional Selection Camp on March 8, the schedule of other Regional Selection Camps are : March 15-16, Iloilo City, Ateneo de Iloilo; March 22-23, Puerto Princesa City, Puerto Princesa Sports Complex; March 23-24, Cebu City, Ateneo de Cebu;March 29-30, Dagupan City, Stadia; April 12-13, Manila, PICC Forum. The National Training Camp will be held in Manila on April 25-27. Jr. NBA/Jr. WNBA is presented by Alaska Milk. Gatorade and Phoenix Petroleum are Official Partners, while KFC and Spalding are Supporting Partners. The SM Mall of Asia and SM Cinemas are the Official Venues for Jr. NBA/Jr. WNBA. Official NBA Broadcasters are Basketball TV, NBA Premium TV and ABS-CBN Sports. Jr. NBA/Jr. WNBA is also supported by the Basketball Coaches Association of the Philippines (BCAP). The Jr. NBA program was first conducted in the Philippines in 2007 and has more than doubled in participation in the past six years. Each year a new city benefits from the grassroots basketball program that involves not just young players but also their parents and coaches. This year, more than 80,000 students, parents, and coaches will benefit through Jr. NBA/Jr. WNBA activities including camps and clinics, NBA Cares outreach activities, television programs and digital initiatives. Registration is now ongoing through the Jr. NBA/Jr. WNBA event website www.jrnba.asia/philippines. Fans can also follow us on Facebook at www.facebook.com/jrnbaphilippines. For all things NBA, visit us at www.nba.com and follow us on our official Twitter feed at www.twitter.com/NBA_Philippines. Labels: Jr. NBA / Jr. WNBA Basketball School Clinic On Sunday March 9 in Muntinlupa (Last In Manila): Let's Go!